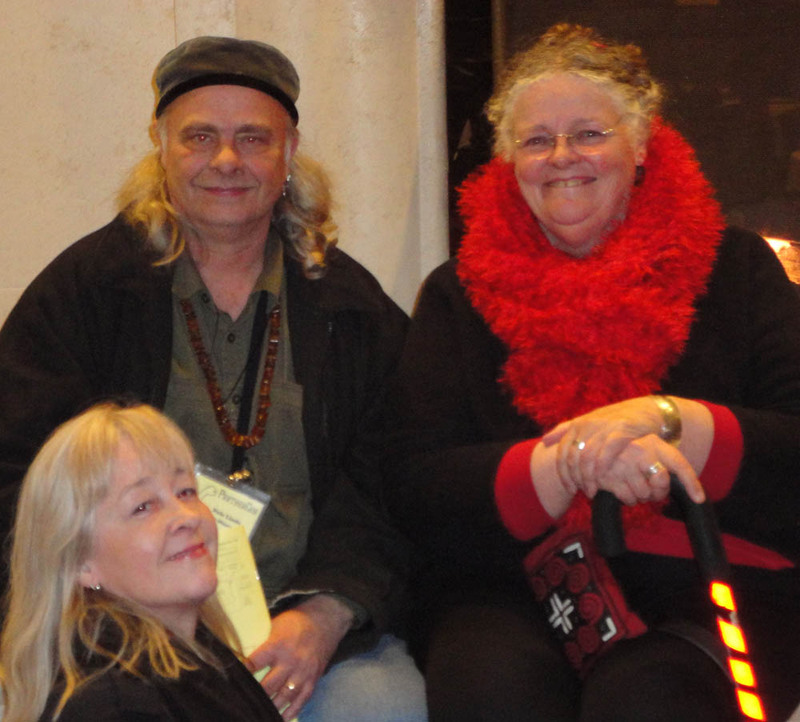 This years Pantheacon, in San Jose, Ca. had a thought provoking theme, “Walking Your Talk”. Rhetorically asked was, “What are we doing individually and as groups to take our vision of Earth Centered Spiritually out into the world?”. As Pagan sub-culture develops in communities like Paganistan, we may find ourselves asking the same question. I asked nine attendees, mostly presenters and authors, but also a couple involved partic ipants the same three questions hoping to get at the essence of west coast thought on the matter. You may find their answers not far from yours! 1) What does ‘Walking your Talk’ (WYT) look like to you? 2) What aspect of WYT is most important for Pagans bring to their relations in the mainstream community? 3) What area of accountability in WYT do Pagans most lack, or is your biggest complaint in Pagans WYT? Victoria Slind-flor – Victoria is a Dianic crone Witch and Artist. She is a journalist and teaches at Cherry Hill Pagan Seminary, and is a member of The Pagan Alliance. She is known to many in Paganistan from a 2005 SHF guest appearance. 1) WYT Look Like? Building and maintaining the community, and a subset of that is building and maintaining the web of life. Our responsibility of stewardship of the planet. It is all interconnected. For me personally, secondarily, it is the empowerment of women. 2) WYT in Community? I think there are Pagans that are often silent when they shouldn’t be. People will send me some outrageous petition for me to sign on to, but they don’t know who their representatives, their congressmen are. Some of them do not vote, in fact some refuse to vote. I know Pagans here today who have said to me it is not feminist to vote. My grandmother is spinning in her grave to hear that! 3) WYT Complaint? Deliberate anti intellectualism. The choice to be antagonistic, paranoid and suspicious about science, the law, and about the media, of which I happen to be a member of. I know so many Pagans who don’t read the newspaper, don’t listen to the news and want to hold forth on all the conspiracies in the world, about which they are largely ignorant. They have no faith in science, and think that the Law is just stupid. They do not understand that our constitution is a sacred document. 1) WYT Look Like? Walking Your Talk for me is having the courage to bring the principles I encounter and embrace, into my daily practice. To find what resonates for me, what sources of higher power work for me. To stretch myself to incorporate those practices or principles. 2) WYT in Community? There are many different flavors of worship here, to put labels on them tends to limit and restrict how many diverse and different cultures could be included. There are cultures beyond the established religious institutions out there right now, and it takes a community like this, at this conference, to explore and find what is of value for me. We need this same attitude in the greater community. 3) WYT Complaint? The challenge is the ability to reach out to those types of worship, that well, maybe aren’t ready to be reached out to. Allow them the opportunity to come and participate here. It is a work in progress, but there is a driving force here, to be inclusive. We need to move out of our comfort zone, that’s good for all people. Ivo Dominguez Jr. – Author, Astrologer, Ritualist, Wiccan Elder. 2004 Sacred Harvest Festival Guest. 1) WYT Look Like? Each Pagan has to discover exactly what it is they are, as a Pagan. I’m not just talking about traditions or paths because ultimately there is a way that our spirituality expresses itself in the physical world. If you are have a particular interest, say in the animal world, well then part of that path is going to be working to improve the status of, say, farm animals. If your focus is around issues of inequity due to gender, then be working on that. Whatever it is that is the primary enlivening spiritual force in your Paganism there should be a way that the world sees it happening everyday. 2) WYT in Community? If we were part of the Christian religion, when we were doing good works, taking care of children, or the elderly, or the environment, that would be seen as well they are doing that because they are in part by being moved by the “Word of God”. If Pagans are seen out and about being Pagan and doing good works, it will change the perception of Paganism within the public. It will be shown that our ‘way” also generates good works. Currently to a lot of folks in the mainstream community do not see a connection between our spirituality and serving the world. In fact we mostly look to them like we are self-serving. 3) WYT Complaint? The willingness to know that what we believe today will probably not be true in ten years. I am not thinking of science, but what is considered to be ‘enlightened’ or ‘progressive’. Hopefully in ten years we will be able to look back and go, wow, that was so backwards. Probably a willingness to feel that however strongly you feel that you are walking your talk today, it is not the final version. Self righteousness and stridency can be toned down quite a bit. 1) WYT Look Like? Realizing that when I see in the back of my mind that I am not doing what I need to be doing, I will start over the next day and commit to do what I need to do. 2) WYT in Community? Living by example. People will emulate what they see us do. If you live true to yourself, those coming along behind will see us doing that we believe. They will be able to create a lifestyle that they see is possible, something lived today in the here and now by someone real and in front of them. People making real and active choices for their lives is an act of beauty. 3) WYT Complaint? Being understanding of what is proactive and what is programmed. You hear people saying, “I can’t do that” or “I’m not worthy enough”, Once we get initiated, and become magical, that is who we are. Owning that is the next step. Getting past that point and realizing what is happening today on the planet, and grasping it and owning it, and empowering ourselves. Daniel – Fan of Drum and FireCircles. Teaches culinary arts. 1) WYT Look Like? I teach to give people the tools to get a better quality of life, eat better, and be able to get a job. When I turned fifty, I turned my life over and decided that what I learned in the first fifty, I will teach in the second fifty. That is how I see walking my talk, transferring that knowledge. 2) WYT in Community? Pagans don’t necessarily plan for the future, as we get older we have to think about that. In this area, we let ourselves down, when trying to function in this society that we are in, we are not planning for financial stability. 3) WYT Complaint? We need to represent ourselves in an honest way, so that we are not giving the wrong information to the people out there. There is a lot more African-American and multi-cultural people here. We need to leave ourselves open to more diverse groups of people. 1) WYT Look Like? someone who is magical on a daily basis. Not something that is just practiced one a month, or who honors a Sabbat. It is being true to yourself and true to the Gods. Having that ‘spark’ on at all times. Publicly, internally, and spiritually, you are an enlightened being. 2) WYT in Community? There is a lot of interfaith activity. Having as many Pagans, including Hindus, involved in communication to monotheists the importance that ‘Pagan’ is not ‘one thing’. Paganism includes a variety of beliefs, a variety of Gods, a variety of Pantheons. Just as there are many ways to say you are Christian, there are many ways to be Pagan. It is an umbrella term. Pagans practice vary differently individually, and yet we are in some ways, the same. We need to show we are as thinking, and are as serious about our beliefs as them, and have the numbers to be counted, and we do count. 3) WYT Complaint? We are falling down by not coming together as a group, and expressing our voice together. We have a lot more in common than different. That way the government has to pay attention. We have to come together without the in-fighting, without saying we are not this, or not that. We are polytheist, or under one term they understand, so that this is what we are, but we have infinite variety. We need that one term. 1) WYT Look Like? Living up to the ethics of your Faith, whatever that is. There is a great responsibility to the Earth. Reducing, Re-using, recycling. We have to remember it is not just the earth, it is all the living spirits on it. Living you way. If your deity points a certain direction, you should go in that way. If you go in it sincerely, honestly, and strongly, then you are ‘Walking your Talk’. 2) WYT in Community? It is about earning respect. If you are a respectful person, a strong person, and a good person, your religion is almost irrelevant. You are that good person. You are on time, you are that good employee, you are all those things. It is important so that people who don’t know who we are, or what we believe or are doing, can get to know us as people first. Then, when they find out you are Pagan they go, ‘Oh, well that is no big deal.”, because this is ‘Patty’ or this is “John’, and they are good people. 3) WYT Complaint? Lack of completion. We set out to do these wonderful things, and we have these great ideas, but then they don’t ever come to fruition. We don’t take the time to learn the practical skills and knowledge we need, and that sets us back. 1) WYT Look Like? I feel like walking your talk means being able to live out and mirror the principles of belief to others and within myself. Too often spiritual concepts become almost cliché and people speak of them automatically but are not living the concepts or internalizing them. 2) WYT in Community? I feel that the most important aspect of walking your talk when building relationships in the broader community boils down to being authentic, taking your craft serious enough to learn and research it and bringing value to the community to help build it instead of tearing it down. 3) WYT Complaint? Pagans often fall short in walking their talk by not learning how to engage in community productively. I believe that we don’t always know how to argue or disagree right, meaning that we bring unhealthy dynamics into the very community we are trying to uphold. We cannot say we are about sustaining the community when we are too engaged in conflict, confusion or even personal interests and are not able to recognize the needs of the community we are building. 1) WYT Look Like? It doesn’t look like what you do inside the Pagan community. It looks like what you do every day of your life. Are you applying that, are you helping people, are you honoring the Goddess in your choices? All the way from turning off an unused light, to picking up trash on the beach. It is easy to walk your talk when you are with your family, but when you really walk your talk is when you are with people who don’t share your beliefs. 2) WYT in Community? The most important thing is that it is not something you are doing to show other people who Pagans are. It is something you are doing participating in the human condition. Other people will find out you are Pagan, even in the closet, and then they will remember what your actions were. Authenticity is putting beliefs into practice in your daily life, and then people finding out you are a Pagan. 3) WYT Complaint? We build walls between each other. I can’t tell you how many times since I have become first officer that someone comes up and whispers in my ear about this person or that person. About ‘that’ organization, or something that happened twenty years ago. As if I am supposed to look at someone and make a judgement about them over something that happened twenty years ago. Even judge a whole tradition. I think we should just let it all go. I am not what I was twenty years ago! Then, I would not have been elected First Officer of COG. I don’t think that history is valuable in any way except to learn the pitfalls of it, and to not let any of it ever happen again. Thanks to all these kind folks who took time out of their frantic Pantheacon experience to speak with me! 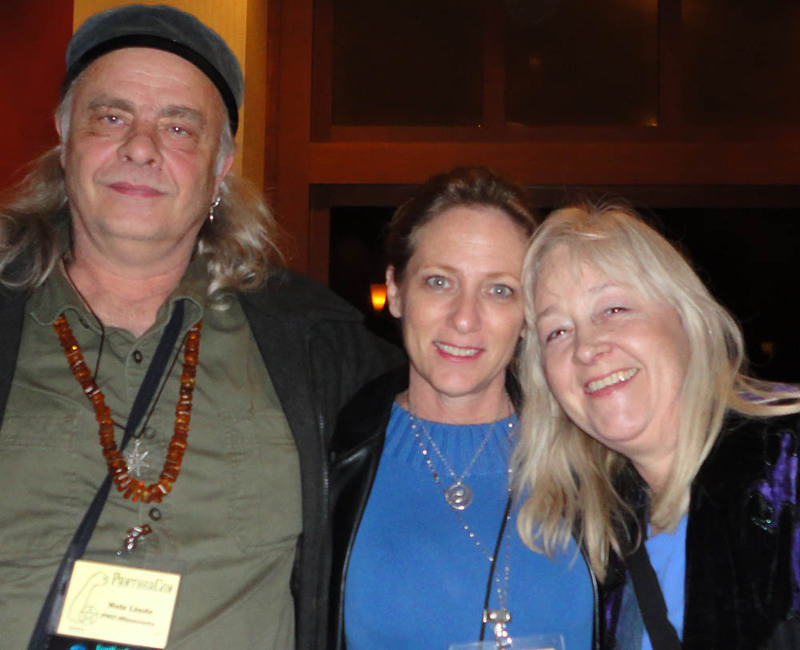 If you feel moved to let words of criticism flow out in the same breath as ‘Walking Your Talk’, heed the wisdom of these West Coast Pagans, take a moment, and answer these questions for yourself, first!